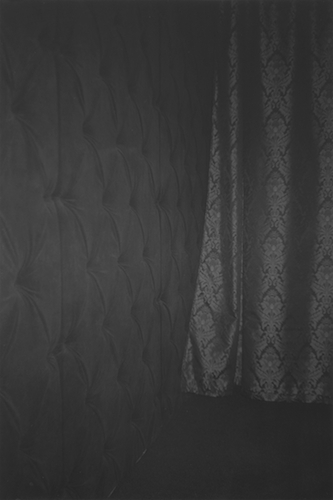 Dirk Braeckman, 27.1/21.7/016/2014, 2014, gelatin silver print mounted on aluminum, 35 x 24". There’s a dense, black space here where light is barely perceptible and matte surfaces intermittently reveal pattern and enigmatic form. Shrouded in a mood of mystery, this is the nature of each frame of Dirk Braeckman’s latest photographs. This exhibition brings together ten small gelatin silver prints with a larger ink-jet print on Japanese silk paper, the latter of which is scaled to almost fill an entire wall. Their subject matter references domestic interiors and landscapes, often approaching abstraction. Swamped in darkness, the corner of a room lies lonely; a curtain billows before an open window, obscuring a cloudy sky; or jagged mountain peaks rise up into the heavens. Braeckman prolongs the moment between exposing his negatives and developing the final photographs. Storing the negatives in an unorganized archive, the artist selects them at a later stage, essentially appropriating his own work as found images. The exact place, date, and time that the images were taken is irrelevant, as is reflected by their indecipherable titles combining letters and numbers, such as 27.1/21.7/016/2014, 2014. Specks of what appears to be dust float within the bottom-right corner of 1/1–P012 a–1/1., 2015, while in the five unique prints that make up the series “56–57–15–2015/1-5.,” 2015, one exhibits marks that are gouged or scratched into the print’s surface, revealing white paper. One has the sense these works are perhaps less concerned with verisimilitude and exactitude than with the textures and surfaces that can be achieved through the medium itself. The handcrafted quality also emphasizes the flatness of the pictures, their space compressed into a self-contained two-dimensional blackness of its own time.